Take a peek inside Cup Fiction. 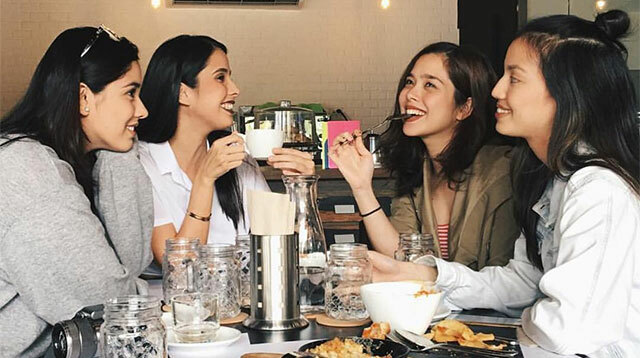 It’s no secret that Saab Magalona-Bacarro is a bookworm and a self-confessed geek (remember her comic book-inspired wedding?). So naturally, when her latest business venture turned out to be a café-slash-library, we must admit that we kinda saw it coming. And while “surprised” may not exactly be the word to describe our feels, ~*excited*~ definitely is! Below, take a peek inside Cup Fiction. Nestled along Katipunan Avenue in Quezon City is a quaint café serving all-day breakfast, artisanal coffee, locally crafted beers, and big fat giant cookies (we don’t know about you, but this part totally got us all ears). Most of the items in the menu also happen to have interesting names that will make you want to order, stat—like the Agawan Plate (P395), their Filipino breakfast skillet with caramelized tocino, tender-cooked pork adobo, homemade longganisa, garlic brown rice, and two eggs; The Dark Knight Rice (P245), a rich serving of Dark Malagos chocolate champorado served with crispy danggit on the side; and then there’s also the Blue Ranger Salad (P250), which is a bowl of mixed greens with apples, candied walnuts, blue cheese, and lemon honey vinaigrette. Oh, and they not only sound good. They look good, too. Plus points for foodstagram-worthy dishes, right? Always. Speaking of which, millennials wouldn’t want to pass this up, because you'd love every nook and cranny to be on your Instagram, too. It's a nice excuse to bring the whole crew together just to chill, catch up, and, well, take lots of photos. But here's the best part: the place is open until midnight! So if you're looking for a spot either to work or play, Cup Fiction can give you the best of both worlds. Visit Cup Fiction at 141 Katipunan Ave., White Plains, Quezon City. For more info, visit cupfiction.ph.